This article is about the basketball player. For the reggae musician, see Wayne Wade. Dwyane Tyrone Wade Jr. (/dweɪn/ dwain; born January 17, 1982) is an American professional basketball player for the Chicago Bulls of the National Basketball Association (NBA). He has established himself as one of the most well-known and popular players in the league. Wade had the top-selling jersey in the NBA for nearly two years, leading the league in jersey sales from the 2005 NBA Playoffs, until the midpoint of the 2006–07 season. After a successful college career at Marquette, Wade was drafted fifth overall in the 2003 NBA draft by the Miami Heat. He was named to the All-Rookie team and the All-Star team the following twelve seasons. In his third season, Wade led the Heat to their first NBA championship in franchise history and was named the 2006 NBA Finals MVP. At the 2008 Summer Olympics, Wade led the United States men's basketball team, commonly known as the "Redeem Team", in scoring, and helped them capture gold medal honors in Beijing, China. In the 2008–09 season, Wade led the league in scoring and earned his first NBA scoring title. With LeBron James and Chris Bosh, Wade guided Miami to four consecutive NBA Finals from 2011 to 2014, winning back-to-back championships in 2012 and 2013. In 2016, Wade departed the Heat in free agency to play for the Chicago Bulls. Dwyane Wade was born on the South Side of Chicago, Illinois, to JoLinda and Dwyane Wade Sr, whose name's unusual spelling was decided by his own mother. In 1977, JoLinda, at the age of 18, already had two children. Wade has described his upbringing in Chicago as being very difficult. Wade stated that "[his] mom was on drugs and [his] family was in the gang environment, so it was a rough childhood." At a very young age, Wade already witnessed police raids and found dead bodies several times in a nearby garbage can. When he was only 4 months old, his parents separated – and would later divorce. Jolinda was given custody of the two children, and she moved to her mother's house with them. The family struggled financially, and it was around that time when Jolinda started dealing drugs. His mom was addicted to several substances including cigarettes, alcohol, heroin, and cocaine. JoLinda would get high with friends at her home, even in the presence of her children. In an interview with ESPN, Wade said "I've seen the needles laying around the house. I've seen my mother shoot up before. I've seen a lot of things my mother didn't even know I'd seen as a kid." At the age of 6, he recalls police – with guns drawn – raiding his home as they searched for his mother. When Wade turned 8 years old, his older sister, Tragil, tricked him – by telling him they were going to the movies – into living with his father, a former Army sergeant, and stepmother in a nearby neighborhood. Wade would still occasionally visit his mom. A year later, his father moved the family to Robbins, Illinois. After moving to Robbins, Wade didn't see his mother for two years. During this time, JoLinda was able to access a free supply of drugs by volunteering to be a tester – i.e., someone who tests street drugs for impurities before the dealers try to sell them. JoLinda was hospitalized and nearly died after she mistakenly injected herself with LSD. In 1994, JoLinda was arrested for possession of crack cocaine with intent to sell and locked up in Cook County Jail. Wade, at the age of 10, reunited with his mom by talking with her at Cook County Jail through a glass panel over a telephone. JoLinda served 23 months in prison for her crimes, but while serving her second sentence in 1997, she failed to report to prison while on work release. During most of Wade's time at Marquette, his mother was either eluding the law or serving time in jail for selling crack cocaine. On October 14, 2001, JoLinda declared that she would change her life and get clean while attending a service at a Chicago church. Wade, then a sophomore at Marquette, went home for Christmas to be with his mom, whom he believed was clean and sober for the first time in his life. However, JoLinda admitted to him that she was actually going back to prison. Wade told ESPN, "I was hurt because I felt like I was just getting my mom back, and now she had to leave again." On January 2, 2002, his mother went back to prison to serve her 14-month sentence. She says she has been clean since 2003. 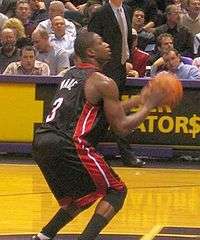 In the 2006–07 season, Wade missed a total of 31 games due to injury. He was elected to his third straight All-Star Game and received All-NBA honors. He became the first guard to earn All-NBA honors after missing at least 31 games in a season since Pete Maravich of the Utah Jazz earned Second Team honors during the 1977–78 season. 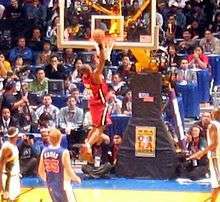 Despite Wade's play, the Heat struggled early in the season with injuries and were 20–25 on February 1, 2007. But with Shaquille O'Neal healthy and Pat Riley returning to the bench after undergoing hip and knee surgeries respectively, the Heat seemed poised to surge into the second half of the season. However, during a game against the Houston Rockets on February 21, 2007, while attempting to steal the ball from Shane Battier, Wade dislocated his left shoulder and was assisted off the court in a wheelchair. After the injury, he was left with the decision to either rehabilitate the shoulder or undergo season-ending surgery. Wade later announced that he would put off the surgery and rehabilitate his shoulder with the intention of rejoining the team in time for the playoffs. After missing 23 games to recover from the injury, Wade returned to the active roster in a game against the Charlotte Bobcats. Sporting a black sleeve to help protect his dislocated left shoulder, Wade played 27 minutes and recorded 12 points and 8 assists, in an 111–103 overtime loss. For the season, Wade averaged 27.4 points, 7.5 assists, 4.7 rebounds, and 2.1 steals per game shooting 50% from the field, and finished the season as the NBA's leader in PER (Player efficiency rating). On July 6, 2016, Wade announced, in a letter to Miami, that he had agreed to join the Chicago Bulls on a two-year deal worth $47.5 million. Wade said he felt unwanted and under-appreciated by Heat president Pat Riley, and noted that his relationship with Riley was in tatters by the end of negotiations. On July 15, he officially signed with the Bulls. He made his debut for the Bulls in their season opener on October 27, scoring 22 points with four made three-pointers in a 105–99 win over the Boston Celtics. The next day, Wade was fined $25,000 for making a throat slash gesture after a game-sealing three-point shot. On November 4, he scored 35 points on 12-of-20 shooting in a 117–104 loss to the New York Knicks. He made five three-pointers to give him 10 in five games in 2016–17; he had a total of seven in 2015–16. Wade was a member of the 2004 US Olympics team with fellow NBA All-Stars LeBron James and Carmelo Anthony. The team competed in the 2006 FIBA World Championship in Japan, in which Wade averaged 19.3 points per game. The team won a bronze medal, which disappointed many USA fans who had hoped for a return to the days of the original "Dream Team". Wade was named to the USA Men's Basketball National Team from 2006 to 2008. He was named co-captain of the 2006 team, along with James and Anthony. In 2007, due to injury, Wade was unable to compete at the Tournament of Americas Olympic Qualifiers, where the United States compiled a 10–0 record and qualified for the 2008 Olympics in Beijing, China. At the 2008 Olympics, the United States went unbeaten and earned gold medal honors, defeating the 2006 World Champion Spain in the final game. Wade led the team in scoring throughout the tournament and tallied a game-high 27 points in 27 minutes on 75% field goal shooting and added 4 steals, 2 assists and 2 rebounds in the game. For the tournament, he averaged a team-high 16 points in 18 minutes on 67% field goal shooting, 4 rebounds, 2 assists and 2.3 steals, as the United States lived up to their Redeem Team moniker and captured gold medal honors for the first time since 2000. On June 28, 2012, it was reported that Wade would miss the 2012 Olympics in London because of knee surgery. Wade is best known for his ability to convert difficult lay-ups, even after hard mid-air collisions with larger defenders. As crowd pleasing as his high-flying style of basketball may be, some have expressed concerns over the dangers of playing in this manner, as Wade has already hurt his knees and wrists after mid-air collisions with larger players. Wade has also established himself on defense for his ability to block shots and accumulate steals. He became the NBA's all-time leader in blocks for players listed 6'4" (193 cm) and under, which he achieved in only 679 games, over 400 games less than the previous record holder: Dennis Johnson (1100). During the big three era, Wade has seen his overall offensive production decrease, a result of sharing the offense with LeBron James and Chris Bosh, but has succeeded at overall shooting a greater percentage despite taking fewer shots and playing more off the ball. Wade at a party with teammate Udonis Haslem and former teammate Antoine Walker and others. Wade married his high school girlfriend Siohvaughn Funches in 2002. He filed for a divorce in 2007, which was granted in 2010 after a lengthy and acrimonious court battle. In 2011, Wade was granted sole custody of his two sons with Funches, Zaire Blessing Dwyane Wade (born February 4, 2002) and Zion Malachi Airamis Wade (born May 29, 2007). Wade also raises a nephew, Dahveon (born 2002), who is the son of Wade's sister Deanna. Wade began dating actress Gabrielle Union in 2009. According to Wade, he and Union briefly split up at some point early in 2013 due to career demands. During that time, Wade and longtime friend Aja Metoyer conceived a son, Xavier Zechariah Wade (born November 10, 2013). Wade and Union became engaged in December 2013, and married on August 30, 2014, in Miami. Wade's nicknames include D-Wade and Flash, which was given to him by former teammate Shaquille O'Neal who would sing, "He's the greatest in the Universe", in reference to the Queen song of the same name from the 1980 film Flash Gordon. The Heat's 2005 NBA Playoff run and Wade's performances with Shaquille O'Neal hampered by injury, led to an explosion of media attention and rapid increase in Wade's popularity. During those playoffs, Wade's jersey became the top selling jersey in the league and remained so for nearly two years. After the Heat's success and Wade's memorable performances during the 2006 NBA Playoffs, Wade was further elevated into the public's eye and appeared on several talk shows, including Late Show with David Letterman and Live with Regis and Kelly. He also made a guest star appearance on Disney Channel's Austin & Ally as himself, who is an obsessed fan of Austin Moon. Wade is a devout Christian and chose the number 3 because it represents the Holy Trinity. He tithes 10% of his salary to a church in Chicago. His mother, Jolinda, strengthened her ties to Christianity in 2001 after years of drug abuse and dealing. She served as a minister during her final prison sentence in 2002 and 2003. She was ordained as a Baptist minister in January 2007 and formed the non-denominational Temple of Praise Binding and Loosing Ministry in Chicago. In May 2008, Wade purchased a church building for his mother's ministry. ↑ "Dwyane Wade gives out white Hublot watches to Erik Spoelstra, Pat Riley and Micky Arison." YouTube (without intro ad), 6:43. At 0:29 the M.C. introduces Wade. Retrieved November 29, 2013. 1 2 "Bryant passes Wade for top-selling jersey at NBA stores." www.espn.com, January 10, 2007. Retrieved May 14, 2007. ↑ Raab, Scott (November 17, 2010). "Dwyane Wade : Of the Holy Trinity, Which One Is He?". Esquire. I'm a junior — I got that name from my father. I asked him — my grandma said that's how she felt it was spelled. There you go. 1 2 Shipley, Amy. "Schooled With Hard Knocks. ", Washington Post, May 10, 2005. Retrieved June 15, 2007. ↑ Jennifer LeClaire. "She Ain't Playin'". Charisma Magazine. Retrieved January 3, 2016. 1 2 Joseph, Dave. "Hometown still guides Wade", Sun-Sentinel, May 29, 2005. ↑ Dodds, John. "Tom Crean Talks About Dwyane Wade. ", www.marquette.scout.com, June 22, 2006. Retrieved January 29, 2007. 1 2 Gregory, Sean. "Dwyane Wade's Rarefied Air. ", www.time.com, June 21, 2006, Retrieved May 15, 2008. ↑ "Dwyane Wade." www.askmen.com. Retrieved January 20, 2007. 1 2 3 4 5 6 7 "Men's Basketball: Dwyane Wade. ", www.marquette.cstv.com. Retrieved January 20, 2007. ↑ Kamalsky, Matt. "DraftExpressProfile: Dwyane Wade." www.draftexpress.com, May 6, 2008. Retrieved November 26, 2013. ↑ "Wade's jersey to be retired." www.marquettetribute.org. Retrieved November 2, 2009. 1 2 3 4 5 6 "Dwyane Wade." www.databasketball.com. Retrieved January 28, 2007. 1 2 3 4 5 6 7 8 9 10 11 "Dwyane Wade: Biography." NBA.com. Retrieved April 26, 2008. ↑ "Dwyane Wade Marquettee Jersey." www.archive.is. archived from http://www.dwaynewadejersey.net/marquette.php, July 28, 2012. Retrieved November 29, 2013. ↑ Associated Press. "Dwyane Wade to enter NBA draft." www.signonsandiego.com, May 1, 2003. Retrieved January 29, 2007. ↑ "Marquette to Retire Dwyane Wade's Number. 3 Jersey." www.cstv.com, September 29, 2006. Retrieved January 20, 2007. ↑ Dwyane Wade, sports-reference.com, accessed 22 May 2013. ↑ "Miami Heat 2003–04 Game Log and Scores. ", www.databasebasketball.com. Retrieved January 20, 2007. 1 2 "Miami Heat (1988 - )" www.databasebaketball.com. Retrieved January 20, 2007. 1 2 3 "Miami Heat 2004–05 Game Log and Scores." www.databasebasketball.com. Retrieved January 29, 2007. ↑ "2005 Playoff Eastern Conference Finals Game 6." www.nba.com. Retrieved January 20, 2007. ↑ "2006 NBA All-Star Game." www.nba.com. Retrieved January 20, 2007. ↑ "Shaq Daddy's double-double drops 'Baby Bulls' out of postseason." www.cbs.sportsline.com, May 4, 2006. Retrieved January 20, 2007. 1 2 "Heat Headed To First NBA Finals." www.nba.com. Retrieved January 31, 2007. ↑ "Wade's heroics Have Heat One Win From Title." www.nba.com, June 8, 2006. Retrieved January 31, 2007. ↑ 'Box score-Game 4 2006 NBA Finals." www.nba.com. Retrieved January 31, 2007. ↑ "Box Score-Game 3 2006 NBA Finals. www.nba.com. Retrieved January 20, 2007. ↑ "Wade, Payton Rally Heat Past Mavericks in Game 3." www.nba.com. Retrieved January 20, 2007. ↑ "Wade's World: Finals MVP leads Heat to first title in team history". www.espn.com. June 20, 2006. Retrieved June 17, 2010. ↑ Nance, Roscoe. "Who's the best in the NBA: The case for D-Wade." USA Today, October 31, 2006. Retrieved March 12, 2007. ↑ Hollinger, John. "Greatest Finals performances - No. 1." www.espn.com, June 15, 2012. Retrieved December 1, 2013. ↑ "Miami Heat Schedule/Results - 2006-07." www.espn.com. Retrieved February 26, 2007. ↑ "Pacers Storm Back, Beat Heat in Shaq's Return." www.nba.com. Retrieved April 12, 2007. ↑ "Wade Injured as Heat Fall to Rockets." www.nba.com. Retrieved April 12, 2007. ↑ Associated Press. "Wade injured in Riley's return; Heat lose to Rockets." www.espn.com. Retrieved February 21, 2007. ↑ "Season-ending surgery an option for Wade." www.espn.com, February 23, 2007. Retrieved February 25, 2007. ↑ "Wade says he'll try to return for playoffs. "www.espn.com, March 5, 2007. Retrieved March 5, 2007. ↑ "Wade's return doesn't spell win as Heat fall to Bobcats." www.espn.com. Retrieved April 8, 2007. 1 2 3 4 5 "Dwyane Wade." www.basketball-reference.com. Retrieved April 18, 2007. ↑ "Bulls strip Heat's crown, win first series since Jordan era." www.espn.com. Retrieved April 27, 2007. ↑ "Wade might need offseason to recover." www.espn.com. Retrieved May 15, 2007. ↑ "Wade returns for Heat, but Durant, Sonics end 0-8 start." www.espn.com. Retrieved November 14, 2007. ↑ "Procedure to sideline Wade for rest of season." www.espn.com. Retrieved March 10, 2008. ↑ "Garnett, Kobe, Iverson headline All-Star starters roster." www.espn.com. Retrieved November 14, 2007. ↑ "Wade To Have OssaTron Treatment." www.nba.com. Retrieved March 10, 2008. ↑ "First Time for Wade." www.uofmtigers.blogspot.com, November 20, 2008. Retrieved, December 9, 2013. ↑ "Miami Heat's Dwyane Wade: 'I'm ready to go.'" www.topix.com. Retrieved, December 9, 2013. ↑ "Raptors' big men roll as Wade's 40 points, 11 assists not enough for Heat." www.espn.com. Retrieved January 23, 2009. ↑ "Howard tops balloting for 2009 NBA All-Star Game." www.nba.com, February 10, 2009. Retrieved, January 22, 2009. 1 2 "Magic cool down Heat despite Wade's career-high 50 points." www.espn.com. Retrieved, February 23, 2009. ↑ 'Wade's career-best 16 assists send Pistons to 7th straight loss." www.espn.com. Retrieved, February 24, 2009. ↑ Arnovitz, Kevin. "Daily Dime: Rockets Are Still Dangerous Without McGrady." www.espn.com, February 25, 2009. Retrieved, March 1, 2009. 1 2 "Wade scores 46, 15 coming in a 19–0 run in the fourth, as Heat sink Knicks." www.espn.com. Retrieved, March 1, 2009. 1 2 "LeBron outduels Wade 42–41 as Cavs rally from 11 down in 4th quarter." www.espn.com. Retrieved, March 4, 2009. 1 2 "Wade has 35 points, 16 assists in Heat victory." www.espn.com. Retrieved, March 5, 2009. 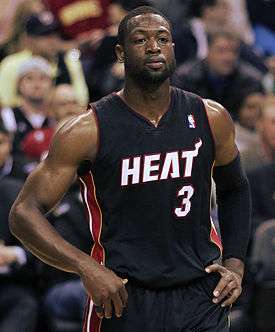 1 2 'Wade helps Heat nip Bulls in double-overtime win." www.espn.com. Retrieved, March 15, 2009. ↑ "Elias Says: Monster Game for Wade." www.espn.com. Retrieved, March 15, 2009. 1 2 "Wade's 50 points, 10 boards lead Heat's 3OT win over Jazz." www.espn.com. Retrieved, March 15, 2009. ↑ Haberstroh, Tom. "Inside Wade's all-time blocks mark." www.espn.com, December 2, 2013. Retrieved February 12, 2014. ↑ "Lessons in Transcending Valuable: Part III. ", www.nbamate.com. Retrieved, March 27, 2009. ↑ "Miami moves three games ahead of Pistons in East standings." www.espn.com. Retrieved, March 24, 2009. ↑ "Wade's double-double paces Heat past Bobcats, into playoffs." www.espn.com. Retrieved April 9, 2009. 1 2 "Wade drops in career-high 55 as Heat clinch East's 5th playoff spot." www.espn.com. Retrieved April 13, 2009. ↑ "Wade reaches milestone." www.espn.com. Retrieved November 2, 2009. ↑ "Cavs prevail as James, Wade put on show in Miami." www.espn.com. Retrieved November 13, 2009. ↑ "Nets remain winless after Wade drains winner from 3 in final second." www.espn.com. Retrieved November 15, 2009. ↑ "Rondo has 25, tying layup before Celts win in OT." www.espn.com. Retrieved January 7, 2010. ↑ "Voters pick LeBron, Kobe to lead East, West to Dallas." www.nba.com. Retrieved January 22, 2010. ↑ "2010 NBA All-Star Game recap." www.nba.com. Retrieved February 15, 2010. ↑ "Wade strains calf and leaves Heat's win early." www.espn.com. Retrieved February 18, 2010. ↑ "Wade, Stoudemire named Players of the Month for March." www.nba.com. Retrieved April 3, 2010. 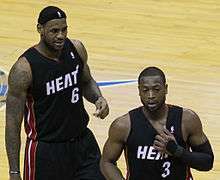 ↑ "Heat stave off elimination as Wade dominates Celtics in second half." www.espn.com. Retrieved April 26, 2010. ↑ "Celtics boot Wade, Heat to set up showdown with Cavs." www.espn.com. Retrieved June 6, 2010. ↑ "Wade granted one of his wishes with Bosh coming to Miami". www.nba.com. Retrieved October 30, 2010. ↑ Stanhope, Kate. "LeBron James Leaves the Cleveland Cavaliers for Miami Heat." www.tvguide.com, July 8, 2010. Retrieved January 2, 2014. ↑ "HEAT Re-Sign Wade and Acquire James and Bosh". NBA.com. July 10, 2010. Retrieved February 27, 2013. ↑ Hillesland, Zac. "Mavs Win the N.B.A. Championship." www.offthedribble.blogs.nytimes.com, July 12, 2011. Retrieved January 2, 2014. ↑ Chiavetta, Ryan (January 13, 2012). "Chris Bosh Says Dwyane Wade, Not Lebron James, Should Be Heat Closer". New England Sports Network. Archived from the original on January 13, 2012. ↑ Goodman, Joseph. "Dwyane Wade leads Miami Heat over Indiana Pacers to advance to Eastern Conference Finals." www.miamiherald.com, May 24, 2012. Retrieved January 2, 2014. ↑ "Dwyane Wade will miss Olympics." www.espn.com, June 29, 2012. Retrieved January 2, 2014. ↑ Associated Press (July 9, 2012). "Dwyane Wade has knee surgery." ESPN.com. Retrieved December 28, 2012. ↑ Winderman, Ira (October 11, 2012). "Dwyane Wade returns as Heat pound Clippers 94–80." South Florida Sun-Sentinel. Retrieved December 28, 2012. ↑ "Heat at Clippers – October 11, 2012." www.nba.com. Retrieved December 28, 2012. ↑ Joseph, Adi. "Dwyane Wade on groin kick, suspension: 'I just reacted.'" www.usatoday.com, December 28, 2012. Retrieved January 30, 2014. ↑ Beck, Howard. "Pushed to the Limit, James and Miami Repeat as N.B.A. Champions." www.nytimes.com, June 20, 2013. Retrieved January 30, 2014. ↑ "2013 NBA Finals." www.basketball-reference.com. Retrieved January 30, 2014. ↑ Sean Newell. "Dwyane Wade And Chris Bosh Opt Out Of Contracts". Deadspin. Retrieved January 3, 2016. ↑ "HEAT Re-Signs Dwyane Wade". Miami Heat. Retrieved January 3, 2016. ↑ "Heat at Knicks". NBA.com. Retrieved January 3, 2016. ↑ "Jazz at Heat". NBA.com. Retrieved January 3, 2016. ↑ "Dwyane Wade of Miami Heat won't play in 2015 NBA All-Star Game". ESPN.com. Retrieved January 3, 2016. ↑ "Dwyane Wade opts out of contract with Heat; Luol Deng opts in". miamiherald. Retrieved January 3, 2016. ↑ "HEAT Re-Signs Dwyane Wade". NBA.com. 10 July 2015. Retrieved 13 July 2015. ↑ Siddiqi, DJ (May 9, 2016). "Wade bounces back in shooting". clutchpoints.com. Retrieved May 12, 2016. ↑ "Wade announces in letter he's leaving Heat to join Bulls". National Basketball Association. Associated Press. July 6, 2016. Retrieved July 7, 2016. ↑ Reynolds, Tim (July 6, 2016). "Coming home: Dwyane Wade leaving Heat for Bulls". Associated Press. Retrieved July 6, 2016. ↑ Shelburne, Ramona (July 6, 2016). "Dwyane Wade commits to Bulls, tells AP he's made 'the right choice'". ESPN. Retrieved July 6, 2016. ↑ Berger, Ken (July 6, 2016). "As Dwyane Wade walks away from Miami, nothing seems sacred anymore". CBS Sports. Retrieved July 6, 2016. ↑ Le Batard, Dan (July 7, 2016). "Messy breakup is sad, traumatic ending to Wade's epic Miami story". The Miami Herald. Retrieved July 7, 2016. ↑ "Bulls sign Dwyane Wade". NBA.com. July 15, 2016. Retrieved July 15, 2016. ↑ "Wade scores 22 in Chicago debut, Bulls beat Celtics 105-99". ESPN.com. October 27, 2016. Retrieved October 27, 2016. ↑ Pandian, Ananth (October 28, 2016). "NBA fines Bulls' Dwyane Wade $25K for throat slash gesture". CBSSports.com. Retrieved October 29, 2016. ↑ "Knicks rally past Bulls 117-104 in Rose, Noah homecoming". ESPN.com. November 4, 2016. Retrieved November 5, 2016. ↑ "USA accumulated statistics - 2006 FIBA World Championship." www.fiba.com. Retrieved January 31, 2014. ↑ Ventre, Michael. "Our Big Fat Greek Embarrassment." www.msnbc.msn.com, September 2, 2006. Retrieved February 11, 2014. ↑ Ventre, Michael. "Our Big Fat Greek Embarrassment." www.AVsite.gr. Retrieved February 11, 2014. ↑ Mejia, Tony. "Still in the dumps over Team USA? This'll get you out." www.cbs.sportsline.com, September 4, 2006. Retrieved February 6, 2007. ↑ "Carmelo Anthony Named One of Three USA World Championship Team Captains." www.nba.com. Retrieved January 28, 2007. ↑ "James, Team USA bury Argentina for TOA gold." www.espn.com. Retrieved September 9, 2007. 1 2 "2008 Olympic Basketball: Dwyane Wade." www.fiba.com. Retrieved December 25, 2008. ↑ "US hoops back on top, beats Spain for gold medal." www.yahoo.com. Retrieved November 2, 2009. ↑ Zillgitt, Jeff. "Dwyane to miss Olympics due to knee surgery." www.usatoday.com, June 28, 2012. 1 2 3 Hollinger, John. "Hollinger stats-Dwyane Wade." www.espn.com. Retrieved January 20, 2007. ↑ "Wade Leads Heat to First NBA Championship." www.nba.com, June 20, 2006. Retrieved January 29, 2007. 1 2 3 4 Thorpe, David. "Scouting breakdown: The game's best post players." www.espn.com. Retrieved March 29, 2007. 1 2 Thorpe, David. "Scouting report: Best face-up games." www.espn.com. Retrieved March 29, 2007. ↑ Colston, Chris. "In the paint: Wade elevates his defense; Stuckey starting." www.usatoday.com. Retrieved November 2, 2009. 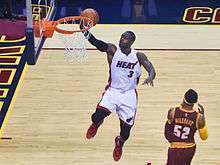 ↑ "Miami Heat G Dwyane Wade closes in on blocks milestone." www.sportsillustrated.cnn.com, November 8, 2013. ↑ "Dwyane Wade wins 2012-13 Kia Community Assist award". Retrieved 2014-05-26. ↑ "Dwyane wins custody of sons." www.espn.com, March 15, 2011. Retrieved February 1, 2014. ↑ "My Story". www.dwyanewade.com. Retrieved 1 December 2013. ↑ "Dwyane Wade's Wants Book to Inspire". ESPN Wisconsin. 11 September 2012. Retrieved 1 December 2013. ↑ Cumberbatch Anderson, Jessica (September 6, 2012). "Dwyane Wade Talks New Book, 'A Father First,' And What He Plans To Teach His Sons About Women". Huffington Post. Retrieved December 31, 2013. 1 2 Cosgrove Baylis, Sheila (December 30, 2013). "Dwyane Wade Fathers Child During Break from Gabrielle Union". People. Retrieved December 31, 2013. ↑ Lilly, Christiana (23 April 2013). "Gabrielle Union: Dwyane Wade Banned Me From Courtside Seats At Miami Heat Games". The Huffington Post. Retrieved 4 May 2013. ↑ Johnson, Zach (April 9, 2012). "Gabrielle Union: I Didn't Break Up Dwyane Wade's Marriage". Us Weekly. Retrieved December 21, 2013. ↑ Johnson, Zach (December 31, 2013). "Dwyane Wade Confirms He Fathered a Son During "Break" With Gabrielle Union, Calls It a "Blessing"". E!. Retrieved December 31, 2013. ↑ D'Zurilla, Christie (December 31, 2013). "Dwyane Wade: Yes, I'm the daddy (though my fiancee's not the mom)". Los Angeles Times. Retrieved December 31, 2013. ↑ Fowler, Brandi (December 21, 2013). "Gabrielle Union and Dwyane Wade Are Engaged--See the Stunning Ring!". E!. Retrieved December 21, 2013. ↑ Rayford Rubenstein, Janine (August 30, 2014). "Gabrielle Union and Dwyane Wade Are Married". People. Retrieved August 30, 2014. ↑ Edison Hayden, Michael; Caplan, David (August 27, 2016). "Dwyane Wade's Cousin Fatally Shot Pushing Baby Stroller in Chicago". ABC News. ↑ 'Atlanta Hawks BasketBlog: Five Reasons To Come To The Heat Game." www.nba.com, November 30, 2005. Retrieved February 6, 2007. ↑ "Dwyane Wade - USA Basketball." www.usoc.org. Retrieved February 1, 2014. ↑ Pitluk, Adam. "Dwyane Wade." www.time.com, June 23, 2006. Retrieved January 23, 2007. ↑ Payne, Marissa (July 14, 2014). "Watch Dwyane Wade sing terribly on the Disney show Austin & Ally". The Washington Post. Retrieved August 21, 2014. ↑ "Dwyane Wade Named One of People Magazine's 50 Most Beautiful People." www.nba.com. Retrieved January 20, 2007. ↑ Stock, Kyle. "Sportsman Gone Sartorial: Dwyane Wade Tries the Necktie Game." Bloomberg Businessweek, November 14, 2013. Retrieved February 2, 2014. ↑ "Dwyane Wade Named to Esquire's 2007 Best Dressed List." www.insidehoops.com, August 9, 2007. Retrieved February 2, 2014. ↑ "Dwyane Wade Named to Esquire's 2007 Best Dressed List." www.nba.com. Retrieved February 2, 2014. ↑ Rovell, Darren. "Jersey sales: Wade No. 1, A.I. No. 2, James No. 3." www.espn.com, December 14, 2005. Retrieved February 2, 2014. ↑ "Dwyane Wade Joins the T-Mobile Sidekick Team." www.t-mobile.com, February 12, 2007. Retrieved August 19, 2007. ↑ Rovell, Darren. "The shoe fits Dwyane Wade." www.espn.com, May 16, 2005. Retrieved January 20, 2007. 1 2 "Jumpman: Wade ditches Converse for Jordan Brand." www.nba.com. Retrieved July 17, 2009. ↑ Ramirez, Quixem. "Dwyane Wade signs shoe deal with Li-Ning worth $10 million." www.fansided.com, October 13, 2012. Retrieved February 3, 2014. 1 2 "Get To Know Us: Wade's World Foundation." www.wadesworldfoundation.org. Retrieved February 08, 2014. ↑ Almeida-Shore, Mary Jo. "The Summer Groove with Alonzo Mourning and Dwyane Wade bring a weekend full of fun and all for a good cause." www.miami.com. Retrieved February 08, 2014. ↑ "Miccosukee Zo's Summer Groove Announces New Partnership With Dwyane Wade." www.prnewswire.com, April 14, 2008. Retrieved February 8, 2014. 1 2 "Wade Helps Family Displaced by Fire." www.espn.com, December 24, 2008. Retrieved, February 8, 2014. 1 2 3 Associated Press. "Dwyane Wade gives jersey to sick boy after Miami Heat game." www.espn.com, March 24, 2009. Retrieved February 8, 2014. ↑ "NBA's Dwyane Wade helps out struggling Robbins library with $25,000 check." www.articles.chicagotribune.com, September 11, 2009. ↑ Holmes, Evelyn. "Dwyane Wade helps Robbins library." www.abclocal.go.com, September 11, 2009. Retrieved February 8, 2014. ↑ Sandler, Michael, and Charlie Zegers. Dwyane Wade (Basketball Heroes Making a Difference.) ISBN 1617724416. Google Books. Retrieved February 8, 2014. 1 2 3 "Mourning, Wade raise money for Haiti." www.espn.com, January 18, 2010. Retrieved February 8, 2014. ↑ "NBA Stars Launch Hoops for St. Jude Week." www.lookthestars.org, March 28, 2012. Retrieved February 8, 2014. ↑ "Ain't Nothing But A Number." www.nba.com. Retrieved March 10, 2008. ↑ Pinto, Matt. "Pinto's Preview: Clippers at Heat." www.nba.com, January 3, 2006. Retrieved March 12, 2007. ↑ "Big offering: Wade gives mother a church." www.usatoday.com, May 18, 2008. Retrieved February 10, 2014. 2003 NCAA Regional Final: Marquette vs. Kentucky From NCAA On Demand on YouTube.